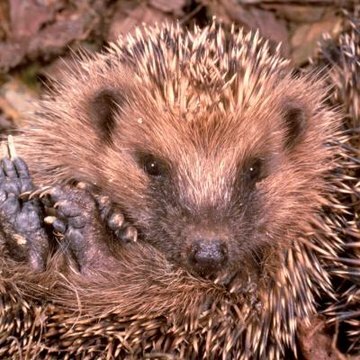 Hedgehogs are family Erinaceidae mammals that are conspicuous because of their extremely spiky exteriors, which help protect them from predators. The hedgehog realm is made up of 20 species across nine genera. As far as reproduction goes, hedgehogs of all species aren't pregnant for the exact same durations. Once a hedgehog is pregnant, the gestation period is usually between four and six weeks in length. The specific species generally determines how long a hedgehog's gestation will be. Four-toed hedgehog (Atelerix albiventris) females are usually pregnant for about 35 days, for example. Southern African hedgehog (Atelerix frontalis) females are usually pregnant for similar lengths of time -- between 30 and 40 days. Western European hedgehog (Erinaceus europaeus) females sometimes have slightly longer gestational periods. They're occasionally pregnant for upward of 49 days. In terms of actual labor, times are different for different mothers. Some hedgehogs give birth in mere minutes, while others require hours. Young hedgehogs also reach physical maturity at slightly varying times in their lives. They generally become mature when they're between 9 and 11 months old, although some do so at faster or slower paces. Male and female southern African hedgehogs often take 12 months to gain reproductive capabilities. Male and female European hedgehogs are often close to 9 months in age when they gain reproductive capabilities. Four-toed hedgehogs are usually extremely speedy in this department. The females are often ready to breed when they're merely 84 days old. Female hedgehogs generally welcome one or two litters each year. Their litters sometimes are as small as four little ones, or as big as seven of the little guys. The mothers typically nurse their piglets for between six and 13 weeks. The time to total weaning generally is determined by the exact species. Before the piglets are weaned, they usually start going on food searches alongside Mom. This generally happens once they get to about a month in age. The mothers diligently demonstrate for them how to acquire sustenance on their own in efforts to prepare them for their upcoming existences as self-sufficient adult hedgehogs. Although many hedgehogs reside out in the wild, many of them also live in captive environments with people -- as prickly pets. If you have hedgehogs of both genders and think that one of your females might be pregnant, you can look out for several common hints of gestation. If one of your females is indeed expecting, she might have an increased desire to eat. She might appear to be a little heavier than normal. You might even notice her partaking in classic nesting behavior -- attempting to establish a cozy nest for her upcoming litter. If you observe any of these things and think that your hedgehog might be pregnant, take her to an exotic veterinarian for a checkup.